The harvest is finally here. That time of year when you’re rewarded for all of your hard work. As a farmer, you’ve scrapped all season for your harvest, but your harvest wouldn’t be complete without some scrap – metal that is. Your farm is stocked with scrap metal items, and since you’re already selling truckloads of your farm goods, why not sell some metal too? You might be surprised by the value of your old implements, rusted plows, broken combines, beaten-up tractors and extra repair metal. 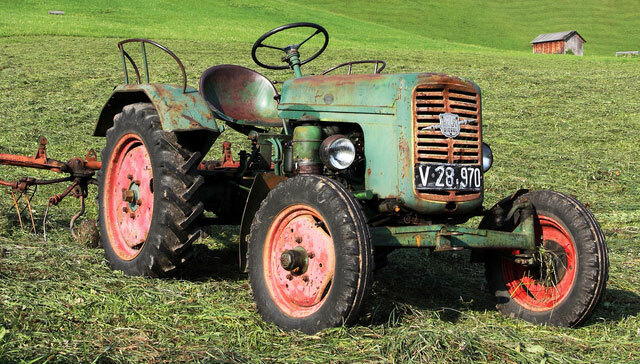 “Old tractor” picture courtesy of Flickr Creative Commons, taken by Mathias Erhart on Aug. 21, 2010. As a scrap yard, we always keep an eye on scrap metal prices in the U.S. and throughout the world, and we’ve received an optimistic outlook for scrap metal prices in Nov., 2013. Analysts announced Turkey, one of the world’s largest importers of scrap metal, is expected to continue purchasing large quantities of scrap metal from the U.S. through 2020. More recently, Japan has seen an increased demand in scrap metal, according to American Metal Markets, the standard for scrap metal recycling prices and news. This is all good news for you, the avid farm scrap collector. That rusty, old farm plow, the reaper from 1955 and the hog oiler from before you can remember – they’re all sitting in that heap of items in the corner of your pull barn. We understand. We can’t help it either. Collecting old items that have to be useful is what we do; we’re a scrap yard. You were right to keep your old implements. Collecting all those farm items will make for a nice payday, and the more you collect, the more money you can make. You’re a modern day, technologically savvy farmer using state-of-the-art equipment, wit and hard work. The agricultural industry has undergone a 21st century renaissance, and farm implements are increasingly lighter, stronger, more nimble and more efficient. But back in the 50s, 60s and 70s, farm implements were massive, gargantuan beasts of the industrial age. The old days saw tools that weighed as much as an elephant. If your farm has ancient implements that are particularly old and heavy, they’re worth their weight in, well, metal. At Alton Materials, we pay for scrap metal by weight, and old farm implements make for excellent scrap metal because they’re so heavy. Bring us what you have, and let us reward you for the collecting you’ve been doing. 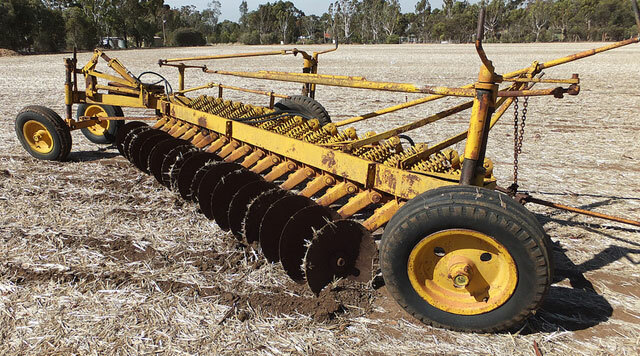 “Chamberlain 14 disc single disc plough” picture courtesy Flickr Creative Commons, provided by Gawler History on April 2, 2013. If you’ve collected a significant amount of scrap and have more metal than you could ever fit into your truck, don’t worry. We will come to your farm and make quick work of sorting your scrap. We’ve got the crews, we’ve got the tools and we’ve got the experience. At Alton Materials, we’re scrap metal experts, and we know how to sort metal to get you the best value for it – all without you having to leave your farm. Let us come by, free up some space for you and give you a good price for your farm scrap metal. Want to learn how to maximize your scrap dollars? Click here to read our post about sorting scrap metal.